This section provides a tutorial example on how to write an OQL (Object Query Language) query statement to search for object instances with specific conditions. Warning: "jhat" has been discontinued since JDK 9. But if you still have JDK 1.8 installed, you can continue to use it to browser heap dump files generated by JDK 9 and JDK 10. To test the power of OQL, I want to find those Object instances created by my program, excluding Object created by the JVM platform. 1. Run a Web browser with http://localhost:7000. The heap dump first page shows up. 2. 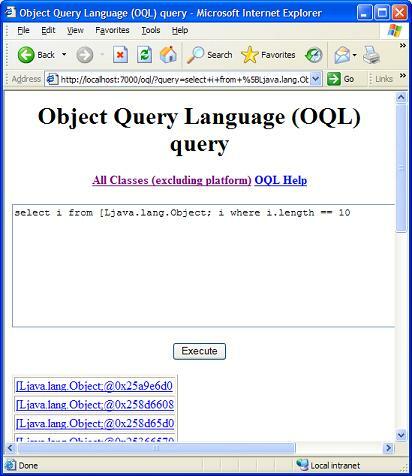 Click the link of "Execute Object Query Language (OQL) query". The OQL query page shows up. But the previous OQL query is not good enough to return only Object instances I wanted. The query below will do a better job. Try it.